sailboat. : Monday Lust List 007. I've been sitting snuggled up in bed on this chilly & slightly rainy bank holiday Monday putting this weeks lust list together and I have to say, I think this is my favourite one to date. I've never been the biggest fan of summer and I think that autumn & winter clothes are far more flattering, the rich colour palettes start to work their way into shops around now and it means that we're getting closer to Christmas - yes I am excited for that already! Until this year I had lived on the South coast of England where the winters aren't particularly harsh or cold but now I live in Derbyshire I have a feeling I'll need to stock up on chunky knitwear & hats! 1. Until this year I shyed away from bronzer in my make up routine because I didn't understand the concept of contouring & just assumed it would make my fair skin look orange. Now that I use my Bourjois chocolate bronzer daily I've been itching to try out some other bronzers. Benefit's 10 boxed powder has recently appeared on my make up radar & I'd really love to try it. I think with a light hand I could make the darker contour colour work & the pinky highlight shade just looks beautiful! These are expensive at £23.50 but I'm pretty confident that it would last for ages even if used on a daily basis! 2. I need a gel or cream eyeliner that isn't going to smudge or transfer on me a couple of hours into the day. I love the winged eyeliner look but I just can't wear it because nothing stays put for longer than a couple of hours. The time has come to admit that Blacktrack fluid line from MAC just doesn't cut it so I've been looking at either Clinique's Brush on Cream Liner or the Bobbi Brown Long Wear Gel Eyeliner. I'm indecisive so I have no clue which one to try first, I think I might be leaning towards the Bobbi Brown ever so slightly even though it's £2 more expensive! 3. I've seen reviews of the new 'they're real' mascara from Benefit & I need it in my life. It's pricey though, so that's what's stopped me from purchasing thus far. I'm one of those people that wants an amazing mascara for a super cheap price. I hate hate hate throwing out a pricey mascara after three or four months - it makes my purse hurt too! 4. 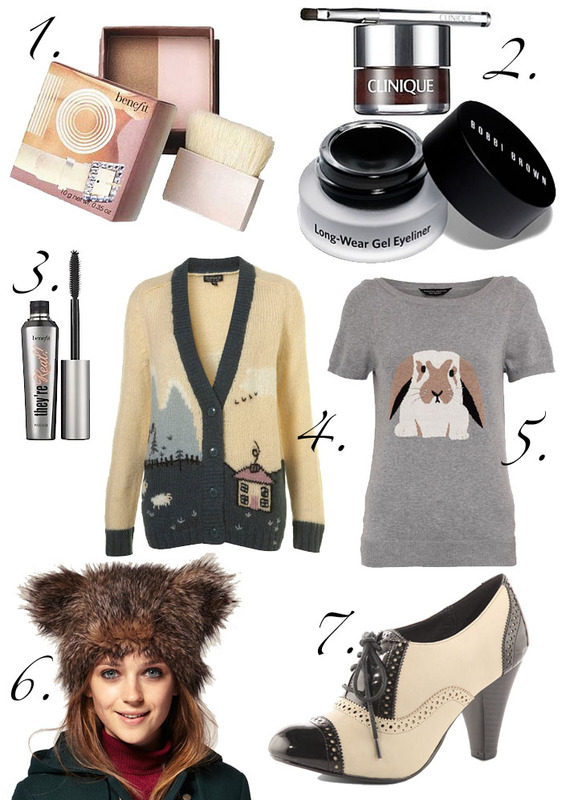 This Knitted Sheep Jacquard Cardigan from Topshop is AMAZING! It's so AMAZING I have to type the word AMAZING in capital letters. I'm not going to lie, it would be a thousand times better if it had bunnies on it, but I like the sheep too. I have to have it. Seriously. But why oh why are Topshop prices so insanely expensive? I wish I could afford to spend £65 on a cardigan, but I can't and honestly, I don't know many people who can! 5. Bunny! I think we all know why I'm lusting after this beautiful Grey Bunny Motif Jumper from Dorothy Perkins, I am indeed bunny crazy. This little lightweight knit is £28 which seems a little pricey to me. Maybe I'm just incredibly cheap but I'd spend £28 on it if it were thicker and had long sleeves. I can't deny the design is adorable & I love the bunnies little expression but I have no idea what I'd wear this with since I'm not really a jeans kind of girl! I think I'll just admire this one from afar! 6. I saw this Fantasy Fur Bear Ears Hat on ASOS and instantly fell in love. I showed it to my boyfriend and asked if he'd disown me & not be seen in public with me if I wore this & much to my surprise, he actually really likes it! It's ridiculously adorable and I also think it will be very practical come winter - nobody wants a cold head or cold ears, right?! 7. Okay so these would most definitely not be practical in Winter when the roads are covered in snow and super slippery but they are pretty gosh darn lovely! I think I've said this before but since performing the heel test (where I stand next to my boyfriend in a pair of heels to see who's taller) & my boyfriend ended up being the taller one, a lot of heels have found their way on to my lust lists. I love these brogue heels from Dorothy Perkins a lot, but I'm not sure where I'd wear them. They're not really a 'wear them to pop to the shop' kind of shoe! Have you got/had any of these items before? Which eyeliner should I try first, the Clinique or the Bobbi Brown? I'd love to know your opinions! 2. It really is just AMAZING! Haha. Love the rest of the wishlist, I am so getting into the autumn/winter vibe now, I just want loads of lovely, new, snuggly clothes. i agree with autumn/winter clothes being more interesting than summer clothes. not to mention the fact i don't like getting my legs/arms out anyway! O M G THE TOPSHOP CARDIGAN :O !!!! I love reading your blog and would love to see more lifestyle posts (about how you like living close to your other half, any tips for us long distance lovers, or anything else you want to share :) Great lust list! If you have access to Laura Mercier, I would recommend trying the Caviar Stick Eye Colour before buying the gel. I've been using them on my lower lashline where everything else waters away and these don't budge. You can smudge them on or apply with a thin brush that has been swirled around on the stick. If you're stuck on a gel liner, then Inglot is the one. It practically has to be chiseled off. Good luck on your search! I have some similar flats, but these are gorgeous! I literally NEED no.4 cardi... seen it on topshop website and my jaw actually dropped.. LOVEEEE!!! Bobbi Brown's is great lasts all day w no budge unless you scrub it off. I love it my fav gel liner. That cardigan is AMAZING!! I want! Clinique Gel Liner is the best on the market; better than Bobbi Brown and all others. Honestly, it's amazing. Smokey Grey is a great alternative to black; I just bought it last week and don't want to wear anything else now. About your no. 1 - you should look at Hard Candy Fox in a Box Bronzing Duos - they look a lot like the Benefit one but a fraction of the price!